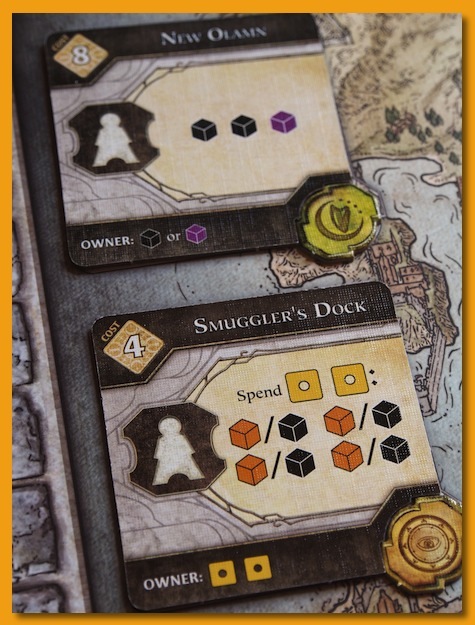 Lords of Waterdeep was first published in 2012 and currently still garners some high praise retaining a 7.82 rating on BGG. I played a friend’s copy a few times and was excited to pick up my own copy from the 2012 Great Lakes Games prize table. However, there it sat, in shrink, until a few days ago. I’ve played with all different numbers except two but Lisa and I fixed that problem playing a couple of games this weekend. At a high-level, players use worker-placement rules to take actions that earn points. 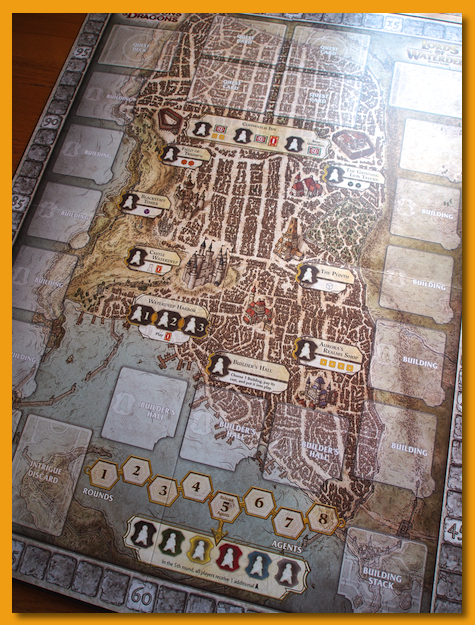 Players take on the secret role of one of the Lords of Waterdeep building buildings, earning resources and victory points, fulfilling quests, and playing intrigue cards in hopes of thwarting other player’s abilities. Each player has a number of agents/meeples (dependent on the number of players) available for action placement. In each of the 8 rounds, players take turns placing an agent on an action location and taking the action the location affords. 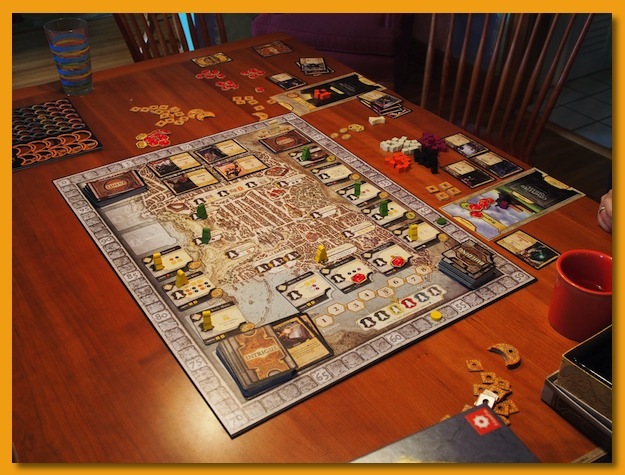 The board depicts a fixed number of actions that are available at the beginning of every game but as the game progresses, more actions will become available (as buildings are built). Which new actions arrive will be different each game (since the order the buildings are exposed and built is random). 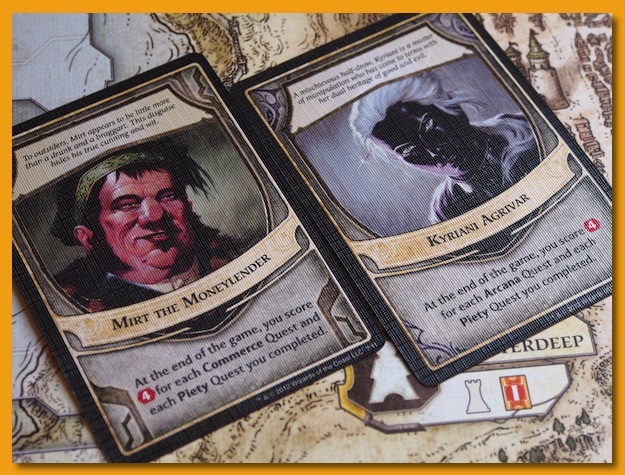 Players gather quest cards throughout the game and use the action spaces to earn money and resources in sufficient numbers to fulfill the requirements of the quest card. 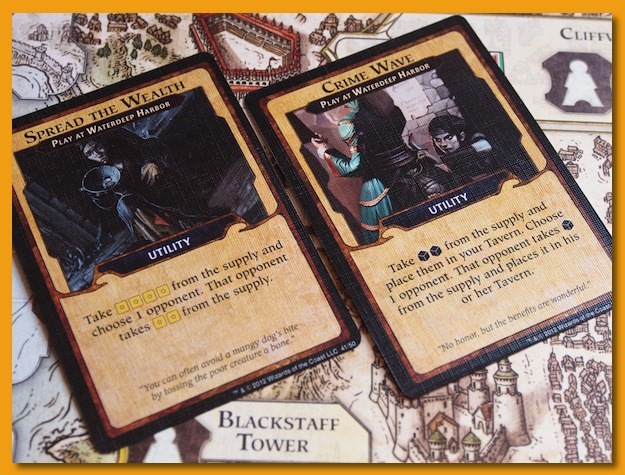 Once fulfilled, the money and resources are turned back into the general supply and the player earns the stated rewards. Some quests have enduring benefits that continue through the game and others simply award a one-time reward. During the round, one or more buildings may be purchased and built. These buildings are placed around the outside of the board and are marked as “owned” with the colored chip that matches the player who built the building. Each building provides another action space for players to place their agent during the round. When an opponent places an agent on a building you have built, you receive a small reward in addition to your opponent taking the action afforded by the building. Several actions on the board keep things lively: becoming start player for the following round, wiping out the display of quest cards and restocking them before taking a card, playing an Intrigue card (which can be an attack card making it hard for other people to fulfill quests), allowing you to place your agent in a location where other agents have already been placed, getting an extra agent for the following round, etc. 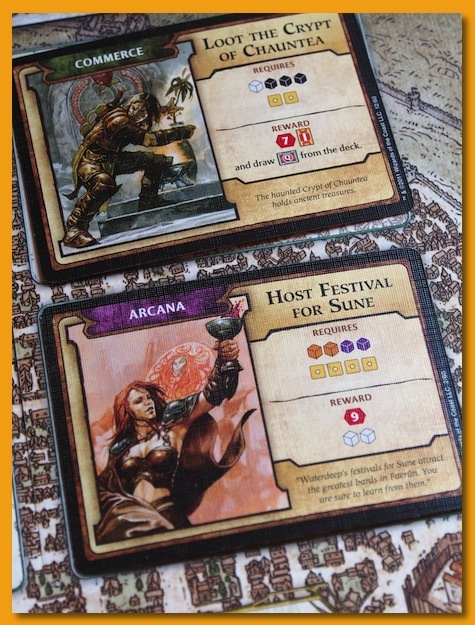 I really like Lords of Waterdeep. It plays quickly and with higher number of players it can become difficult to fulfill your quests as the action spaces that earn resources are highly contested. With two players, that’s not an issue so play is lighter but you come away feeling like you’ve really accomplished something. The game has garnered enough love from the gaming community that at least two or three vendors have popped up producing enhanced resource bits to give the game the little extra visual punch. I’ve heard of some people not wanting to try the game because of its themed roots in D&D but that’s hog wash. The theme is about as strong battling armies in chess. If you get a chance, pick up a copy. Great for 2-5 players and even non-games can pick it up quickly.